Now, where was I before I got carried away with The End of All Things? As soon as the Shire-hobbits entered, there was a chorus of welcome from the Bree-landers. 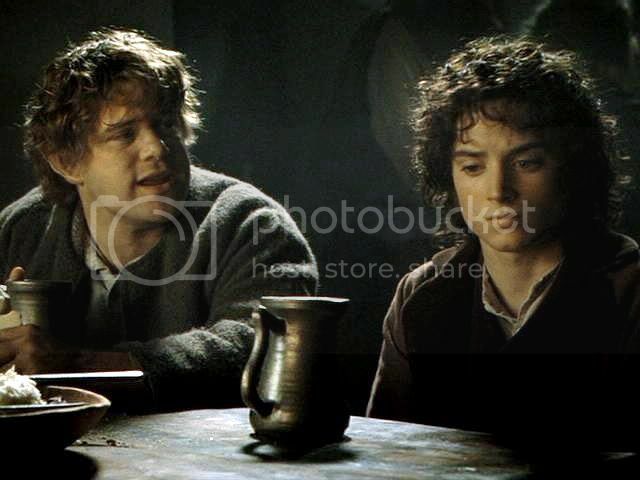 (…) The Bree-hobbits were, in fact, friendly and inquisitive, and Frodo soon found that some explanation of what he was doing would have to be given. (…) He said he was thinking of writing a book (at which there was silent astonishment), and that he and his friends wanted to collect information about hobbits living outside the Shire, especially in the Eastern lands. As you will recall, we left off in the film version with Frodo and his companions, wet and tired, enquiring of Butterbur at the bar. No, Gandalf has not been heard of. 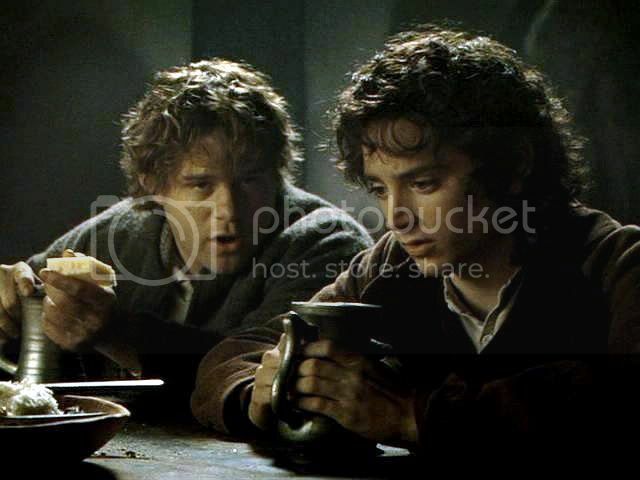 The hobbits look perplexed and distressed. 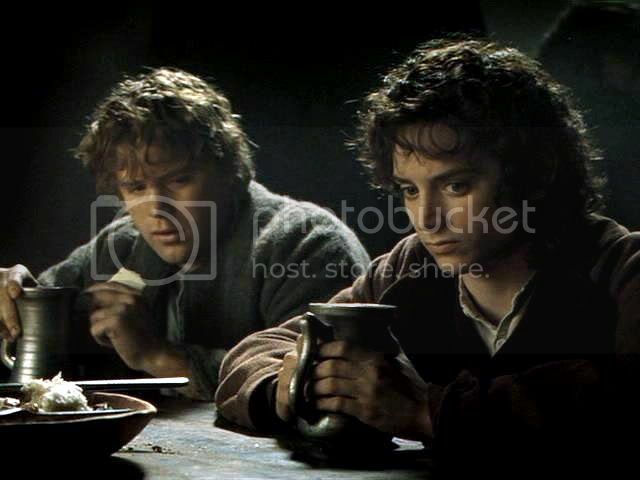 The next segment shows them sitting and drinking their half-pints at a bare, rough-hewn table. Sam is eating cheese and bread. No one greets them and they are left to themselves. Everywhere they look the patrons are Men, dour and strange and in some stage of drunkenness. 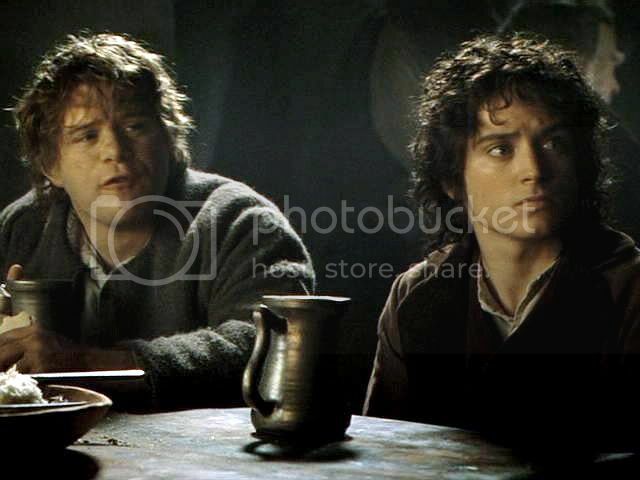 They are the only hobbits. “Sam, he’ll be here. He’ll come,” Frodo says, as if to reassure himself as much as Sam. 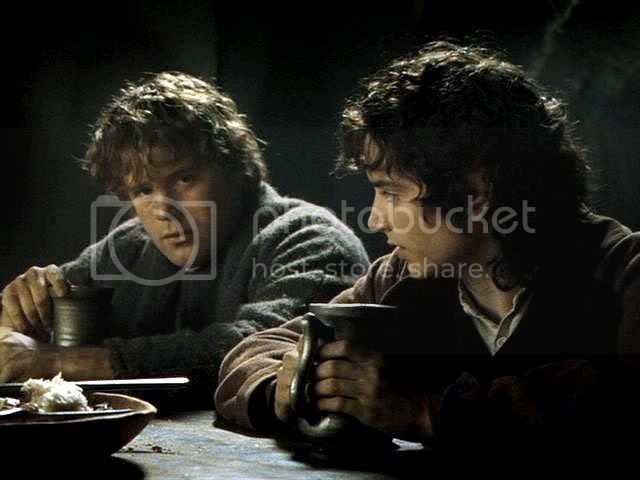 Merry is dodging between surly customers and sits next to Pippin with a brimming mug -- a full pint, not a half. “I’m getting one!” declares Pippin. “You've had a whole half already!” Sam calls out, but Pip is gone. Again, as with the other Bree caps, I have brightened and sharpened these images for the sake of better revealing film-Frodo's expressive (and lovely) face. Sam and Frodo watch as Pip goes to the bar and climbs onto a stool to place his order. “That fellow’s done nothin’ but stare at you since we arrived,” Sam says darkly. 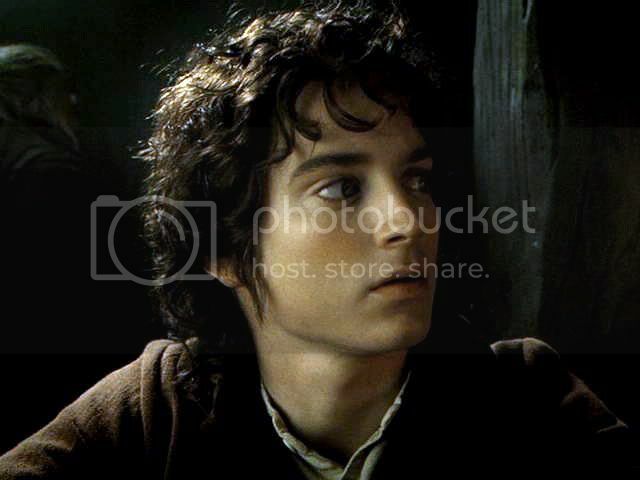 Suddenly Frodo noticed that a strange-looking weather-beaten man, sitting in the shadows near the wall, was also listening intently to the hobbit-talk. He had a tall tankard in front of him, and was smoking a long-stemmed pipe curiously carved. His legs were stretched out before him, showing high boots of supple leather that fitted him well, but had seen much wear and were now caked with mud. A travel-stained cloak of heavy dark-green cloth was drawn close about him, and in spite of the heat of the room he wore a good that overshadowed his face; but the gleam of his eyes could be seen as he watched the hobbits. I hadn't noticed until typing this out, but in the book it is Frodo, not Sam who first takes notice of Aragorn. Doesn’t it just figure? Here I have been moaning about Frodo’s acumen and authority being undermined at the Ford of Bruinen and at Weathertop, but, really, they were whittling away at it from very early on, weren’t they? For next Bree screencaps click here. Click HERE for table of other Frodo [and Elijah Wood] screencaps. But he is a total dish, isn't he? 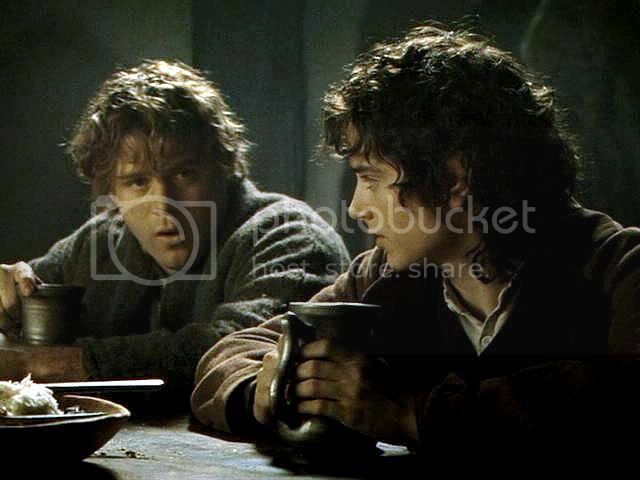 I remember watching a copy of the fan DVD documentary, "Ringers: The Lord of the Fans" and laughing over bits of a fanfic spoof they were reading as a voice-over, something like, "The Very Private Diary of the Fellowship of the Ring." Aragorn's entry was just like what you said, "Find self unaccountably attracted to hobbit with large eyes." LOL, but that section was funny. 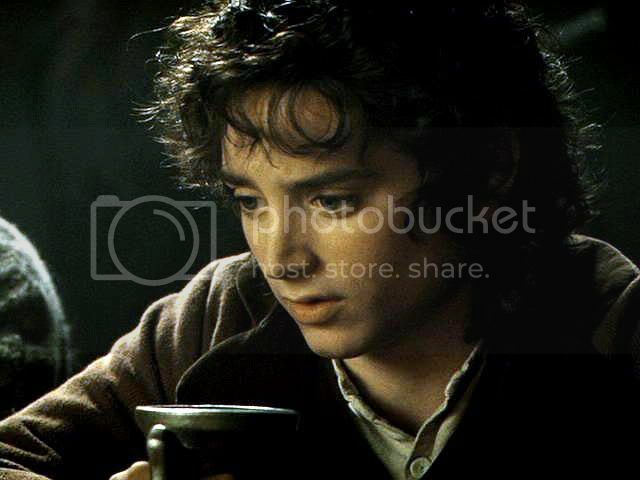 Maybe he should have said, "hobbit with tender, lush lips"? That's one thing I miss about adult EW. He lost his rosebud lips. They were absolutely, irresistibly luscious. Ya know, even the first time I saw this movie, when slash was not even a concept for me, I heard that line and had to say to myself, "WHO COULD HELP IT!! HUBBA HUBBA!" Really, he's extraordinarily beautiful throughout this whole sequence. Just, guh. You really _must_ read the VSD (very secret diaries). A classic! Ah, Mariole, can you believe I never thought a salacious thought when Barliman told him that? I was worried for him. I figured it had to be Aragorn they were talking about, but this was some newfangled film and who knows what they might do? 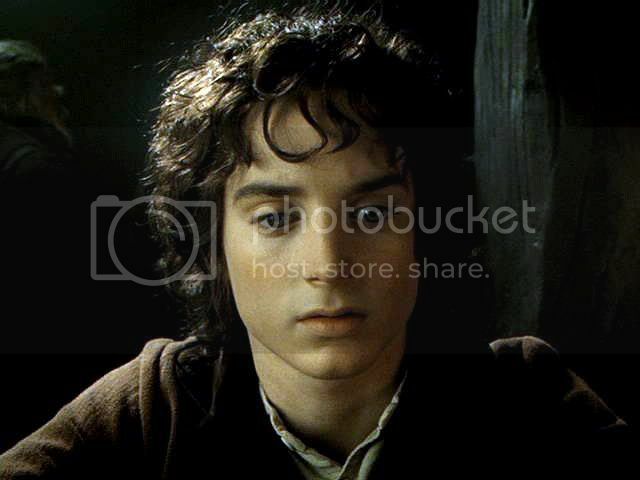 They already had taken out whole chapters and made Frodo leave a year after he got the Ring. But yes, he is very, very beautiful at Bree. So painterly, all the frames, with the strong light and dark, all the browns. Like Rembrandts. 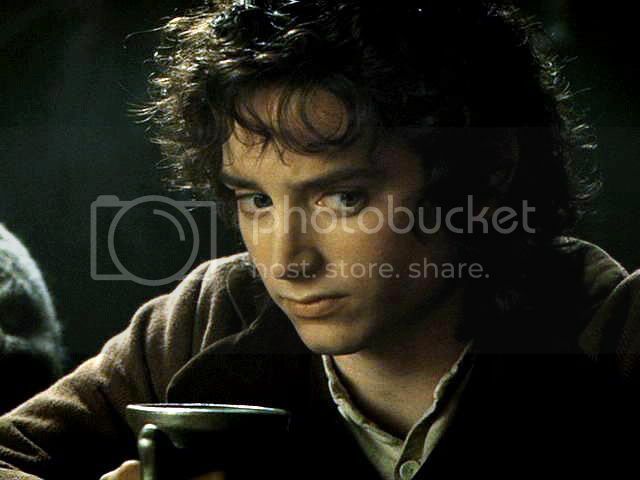 Wait'll we get to the "Call of the Ring" shots -- and there are some "horrified at Pippin's error" reaction shots that, once I had brightened them, were just GORgeous. Oh dear, that boy is so beautiful. Mmmm, it's so great to see these shots. I especially love the first couple of pictures under your heading, "The following caps show Frodo's reactions to Barliman's words". Yeah, those are pret-ty yummy. They've got the eyes made into dark pools of expressiveness by the lighting, the lips like fruit, the cleft in his chin is accentuated and the line of his throat, with the slight rise of the larynx ... Oh, it makes my teeth ache. Thank you, Lindenella. They are *awfully* nice, although not faithful to the actual look of the film. As I did in the other Bree scenes, I brightened and sharpened the frames considerably, all in the attempt to expose yet more film-Frodo loveliness and expression. 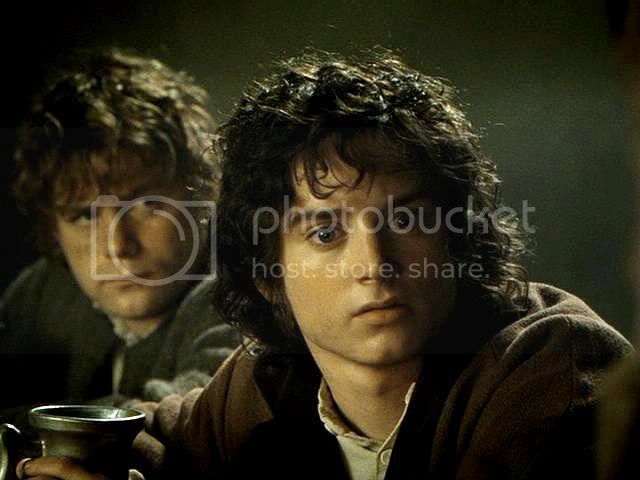 I couldn't make up my mind between the third and fourth pictures in the second section (before Frodo's eyes turn to his left to look towards Aragorn), so I'll have to say they're both my favourite! I have tried to make it easy for me -- and visitors -- to find the screencaps (and manips). I had been using (and do use) the LJ-provided "tags" for organizers. But when I saw the screencap entries had got so numerous and I was spending forever scrolling through entries of "Frodo screencaps" to find the ones I wanted, I made the table of links for them. Last month I went back through and put a link to the table at the bottom of every screencap entry. I also keep a link to it in the left margin under "Links" on the journal page. If you ever find a link that has inadvertently been "broken" or caps that have "dropped out," let me know. Thanks! Oh, those lips. Those LIPS. And that adorable squinch. Oh, I just love it when he squinches. Dark, luscious fruit indeed. I could feast on him all day!!!! Yeah, Strider was pretty intimidating on first read. I was even less sure of him in the film. They already had made Bree and the Pony such gloomy, intimidating places, I wondered if they had some nasty trick up their sleeves for Strider, too. Yes, I loved Bree in the book, so full of warmth and laughter and such a good glimpse into the sort of thing hobbits would consider "having a good time." But I see why they changed it the way they did in the film. I think it worked. "Don't worry, Sam, the beer will come." What depth his eyes have, they are so dark and deep and fathomless. I would willingly let my past life flash before my eyes, if given the chance to drown in them. Those hands look like they are in need of some tender loving care. *Conks out at the very thought of taking care of those hands *. The eyes really are amazing in these shots. Not that they aren't always but differently, I think, in these shots, as your remark points out. "Dark and deep and fathomless". It's almost as if we get a chance to see what EW/Frodo would look like were his eyes dark brown instead of blue. People always wonder aloud if he would be where he was without the "big blues." These caps show me that it wouldn't have mattered what colour they were. The big browns would have killed us, too. Yes, the hands. I couldn't resist putting in a fondling-the-Ring shot so that we could swoon for the hands. I am no fan of bitten nails, but I do think his hands and fingers extremely attractive. Thank you very much for these wonderful screencaps! It does seem impossible for a living person to be a living painting at the same time. 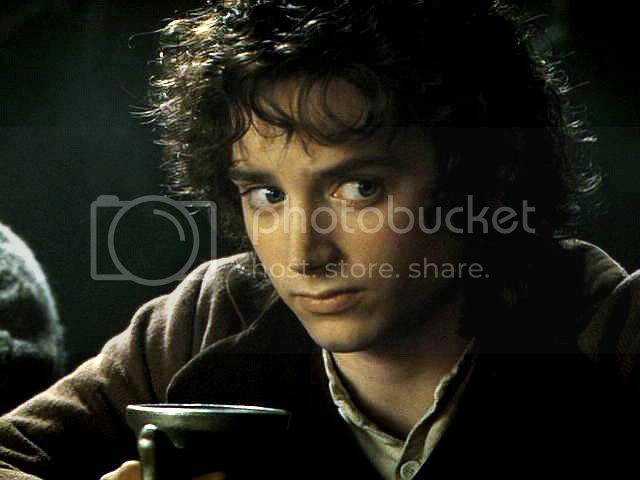 But, as Frodo, EW seems to have done it. Isn't he just the most exquisite thing on earth?? Yes, or on Middle-earth. His lips really were the most delectable to appear on a movie screen, male or female. His 18- 19- and 20-year-old Frodo face is still the face I find most beautiful - to an unearthly degree - of all faces, yet deeply, sensually appealing.